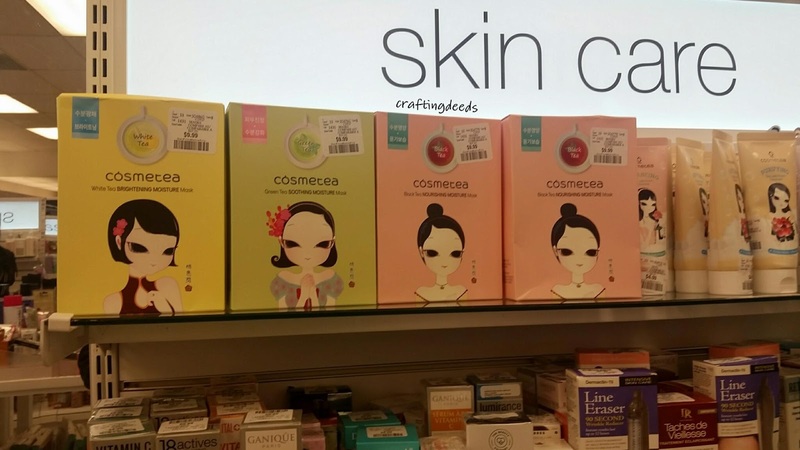 This is a Korean brand that uses different teas in their products. 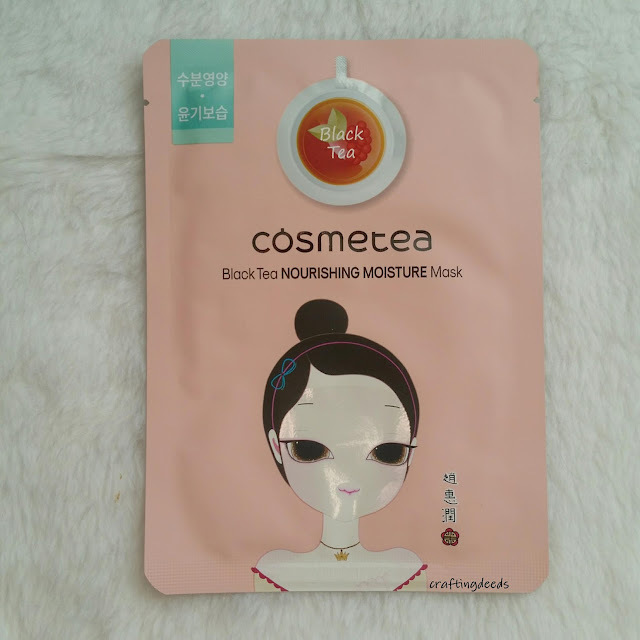 I decided to pick up the Black Tea Nourishing Moisture mask, as I have dry skin and live in a dry environment. 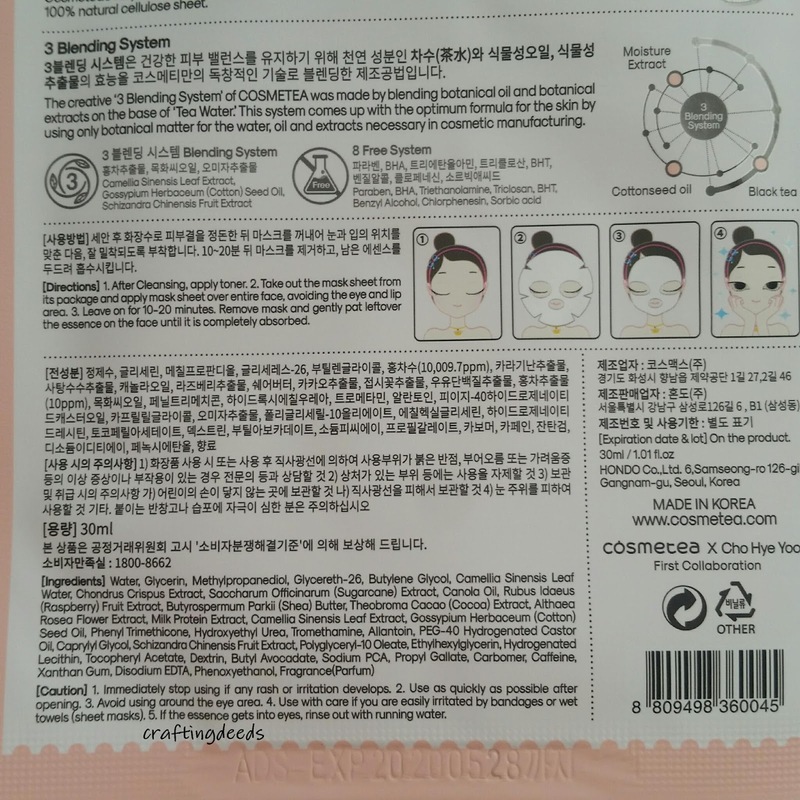 The box of 10 masks only cost $9.99 + GST which is quite reasonable. For some reason I kept on thinking this is a Korean inspired American company, similar to Tatcha (but they are Japanese inspired). But a quick look online shows that this is a Korean company. The mask promises to provide moisture and nutrition to the skin with its specially formulate essence, which is the 3 blending system. The 3 blending system is a blend of Camellia Sinensis (tea) Leaf Extract, Gossypium Herbaceum (cotton) Seed Oil, and Schizandra Chinensis (Magnolia Berry) Fruit Extract to form the "Tea Water". Upon opening, I can smell a strong black tea scent, like English Breakfast. It is a tad sweet and little bit like cologne? I wasn't too upset over the cologne part. It smelled like tea when I put it on my face and the scent lingered after I removed it. Thankfully it's pleasant so I don't mind. 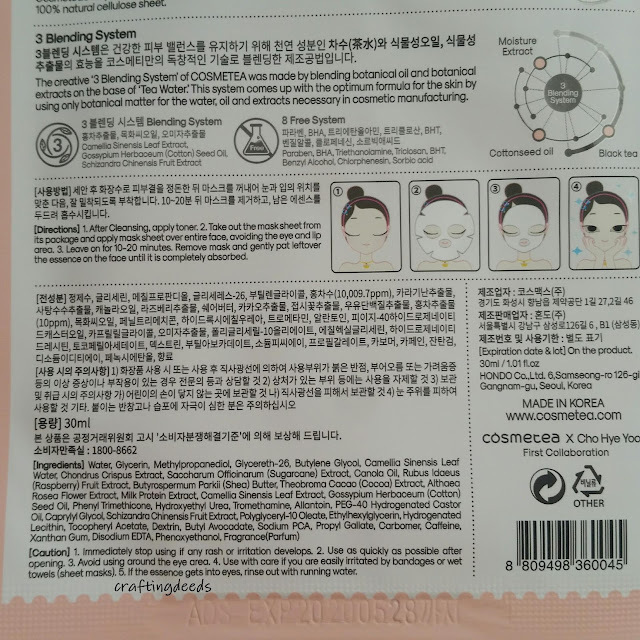 The mask is leaflose sheet which is 100% natural cellulose sheet. It is quite thin and adhered well to my face. It has a good fit, with minimal tenting and minimum adjusting. The mask was drenched in a thick essence. I want to say it is a mix between a milky essence and thin gel. There was so much essence left in the package that I had enough to slap on my face twice. Once on top of the mask and once after I removed the mask. I am quite impressed with the amount of essence. The instructions said to leave on for 10 to 20 minutes. But I actually had it on for about 30 minutes as I had slathered a layer of essence on top of the mask. The mask was still pretty moist when I removed it but I figured 30 minutes was long enough. The extra essence took a while to sink in. I waited 10 minutes and it was not fully sunk in so I had to rub it in. I did put on the remaining essence to finish off my routine. So yes, I only had toner and mask and that was it. I thought because of how much essence was there and how moisturized my skin felt, it would be a good opportunity to see how my skin likes it. Turns out, my skin LOVED it! It did leave my skin feel a bit tight in the beginning, but that feeling went away over time. It did take a long time to sink in. Such that I can still feel my skin being a bit on the tacky side. But man.. My skin felt so soft and dewy upon touch once it has sunk in. My pores looked smaller too. The softness and dewiness lasted all day! I love it! So if you haven't figured out by my last paragraph.. I LOVED this mask! It has a pleasant scent and my skin was so well moisturized afterwards. However, I think this would be an evening mask as it did take a while to sink in. Other than that, I think I need to go and find the other types of masks to try! For $1 per mask, it's definitely worth it!